Jack Butterworth was a star all-around athlete at Bosse High School in Evansville, Indiana where he lettered in football, basketball and baseball. 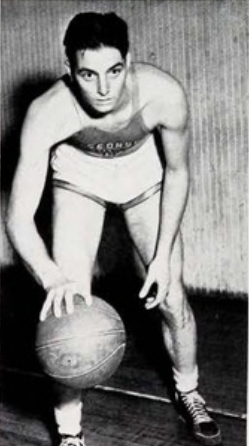 After graduation in 1932, Butterfield spent the next seven years playing college basketball, He spent two years at both Evansville College and Oregon Normal before he completed his collegiate career with three years at George Washington University. Butterworth remained active for another decade in AAU and Independent basketball and played one season of minor league professional basketball with Portland in the Pacific Coast Basketball League. Jack C. Butterworth Born: Jun 19, 1914 Died: Oct 19, 1998 Hometown: Evansville, In.